I have been buying strawberries at the Green Market like they are going out of style. Actually, they're probably going out of season so it's good to get them while I can. My favorite use for them? Cutting them up, letting them macerate in a little bit of sugar, and adding them with a sliced banana to plain yogurt. 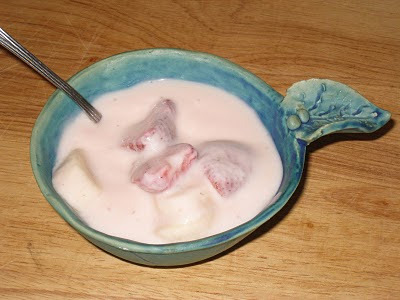 It take a quick minute to prep the strawberries before I head into my morning shower, and then slice the banana and add the yogurt about half an hour later and either eat it right away if I have time before I leave for work, or put it into a container and take it to work with me. Either way, it's sweet and delicious. Much better than any of those "fruit on the bottom" or "fruit mixed in" versions. My brand of yogurt? Stoneyfield Farms, of course. Of course, you can use the low-fat or fat-free versions as well, but ever since reading this post by Usha at Veg Inspirations I have been using whole dairy products. It kind of falls into that whole "whole foods" thing, you know? And when strawberries are out of season? Blueberries are also delicious, with or without the banana. And when there just isn't any fresh fruit that fits the bill, a mixture of dried fruit and nuts can be quite tasty as well.